Reasons Why People Stop Blogging - Blogging has become a new hobby and hope for everyone. Like other jobs, they begin to work with dedication. But over time, they began to move away from blogging. There are several reasons that can make them stop blogging and move to another job. When I try to find out, what is the real reason behind all this. 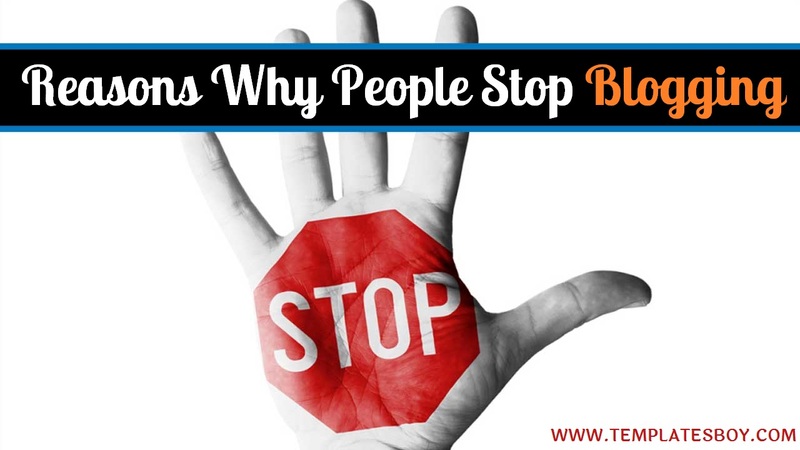 And finally I found 5 reasons why people stop blogging. Many bloggers whose purpose is only money and money, have no other purpose. No one can bloggers in an instant get money. But they never realized that only hard work and consistent efforts would bring success and income. It's true that everyone needs money in this world (which one doesn't need ...), the most potent drug is to be a writer on another blog. "Do you want to be a millionaire in 1 day ?" There is no one who can become a millionaire overnight, even if there are people who might have been successful in their fields. If someone wants to earn money from blogging, the biggest capital is to be patient. One cannot become a genuine blogger, it only takes two days or three days. It takes effort and hard work to become a millionaire in the world of blogging. Many of us find bloggers often copy because they do not have the idea of ​​posting and indeed have the character of copas often. A blogger with a childish attitude will not be able to maintain in the field of blogging, a child will love chocolate. But when you see ice cream, the child will leave chocolate and start eating ice cream. Similarly bloggers also tend to like other things during blogging at some point in time and lose their enthusiasm for writing. I have a friend who wrote a good article at the beginning of his career. The following year he saw Web Designing and development. He started multitasking. As a result, he cannot fully concentrate on blogging. Concentrating on other things makes him and us lazy to blog. So about Reasons Why People Stop Blogging, if you want to add something please write in the comments column. thank you.